Fashion Statements. This is the title of the playful, confrontational collection from conceptual designers, Viktor Horsting and Rolf Snoeren. 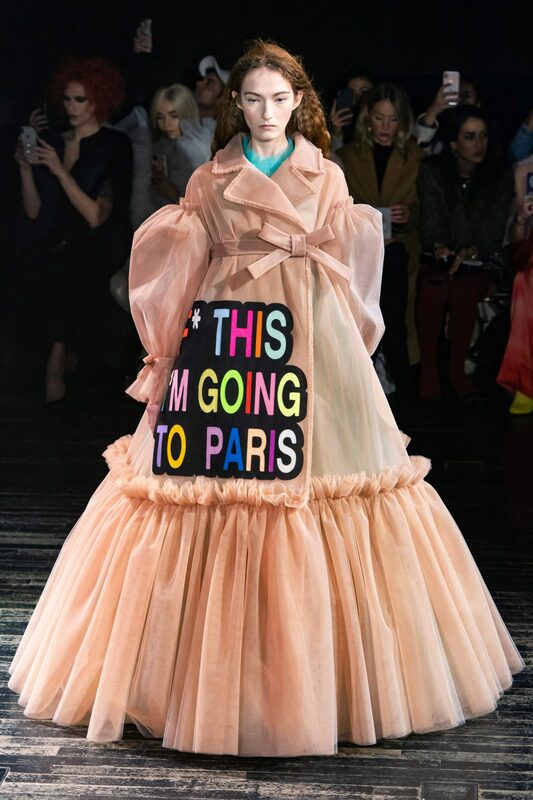 The pair unleashed a timely pastel parade of gowns, extending in some literally weird proportions, this way and that, not to mention the satirical slogans and Instagram-mocking one-liners instantly attracting our attention. 18 models, dressed and accessorized to resemble an innocent, provocative ingenue, came down the runway in dressed created entirely of tulle in various styles, meant to juxtapose the tag lines they were carrying. The assorted typography of the slogans evidently appealed to the virtual world and its overarching influence on all sectors of our lives, despite the designers welcoming us to arrive at our own readings and conclusions of the collection’s intention. Some gowns were fashioned with puffed sleeves, others in full silhouettes, and many with skirts layered in colorful tiers, all immensely voluptuous and unmistakably unforgettable. I am my own muse, said one of the forest green gowns. I want a better world, said the last gown, gothic in strings of black wisps o material, contrasting from its optimistically sunny, smiley face logo. The gown of angelic white, set against a neon green skirt fiercely chimed Give a damn with a graphic design reminiscent of Roy Lichtenstein’s bubble slogans. Naturally, Fashion Statements speaks to the banality of Instagram and the long slew of social media that has come to impend upon our everyday lives, dictating our relationships with ourselves and others, and the way in which we react to events unfolding around us. The romance and the glamour of a period without internet, when face to face connections, courting, and balls in grand homes on the countryside harkens back to represents the perfect contradiction to the large, witticism of the statements. The extravagant volume of each of the pieces showcased Viktor & Rolf’s characteristically avant-garde focus on challenging preconceptions of the revolving relationship between fashion and art. Speaking to the fashion industry, it was ironic in statement, and elegant in its execution, demonstrating the masterfully detailed technique of the Dutch designers.